I am going to share a traditional North-Indian dish, which I learnt from one of virtual friends, like many other dishes. Cooking was not really fun for me until I moved to a new place after getting married and started missing home-made food. So I started following recipes from my friends or sometimes I used to visit different blogs or communities in social networking sites. Those were the days of Orkut before Facebook was born and took over the reins. Most of the recipes in my blog except few baking one were not successful at first trial but learnt them through trial and error method. I always face difficulties when I cook Indian curry to get the perfect texture and taste. 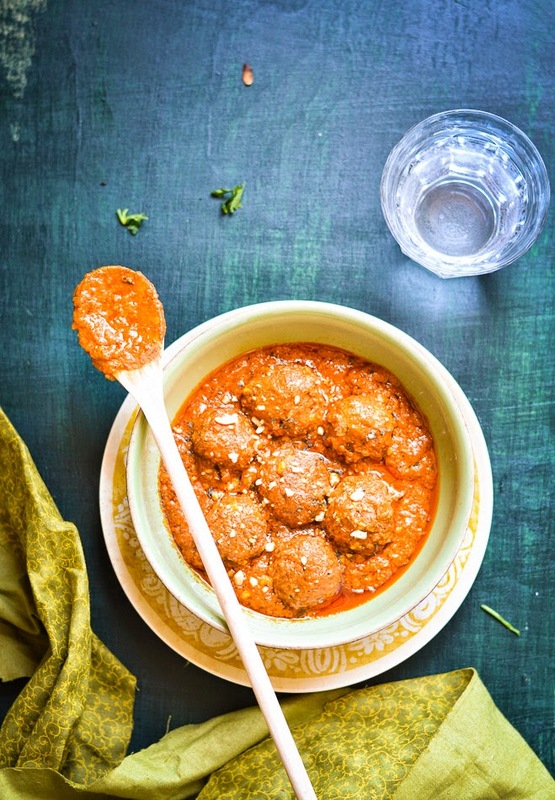 Today's recipe is Malai Kofta Curry, one of our favorite North Indian vegetarian dishes. Whenever we don’t feel like having non-veg anymore, we order this dish. This can easily compete with similar non-veg curry like chicken Tikka or butter masala. In any birthday or anniversary party, it can join as the signature vegetarian dish along with your common chicken or mutton preparation and goes well with naan, paratha, pulao or simply with steamed rice. Kofta is meatball or meatloaf, originated from Iran or other Middle Eastern countries. Probably it came to India during the rules by Muslim Kings. 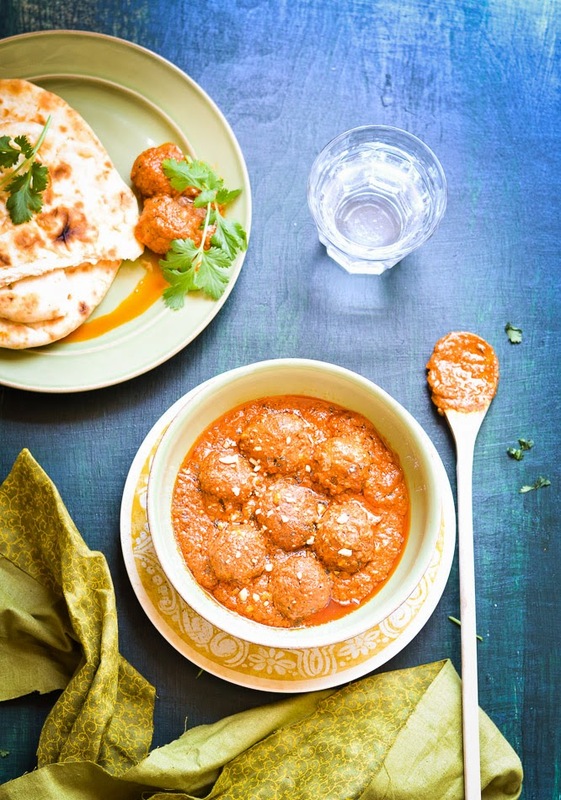 Usually kofta is made of minced or ground meat mixed with spices. But in India, you will find many vegetarian version of this kofta. 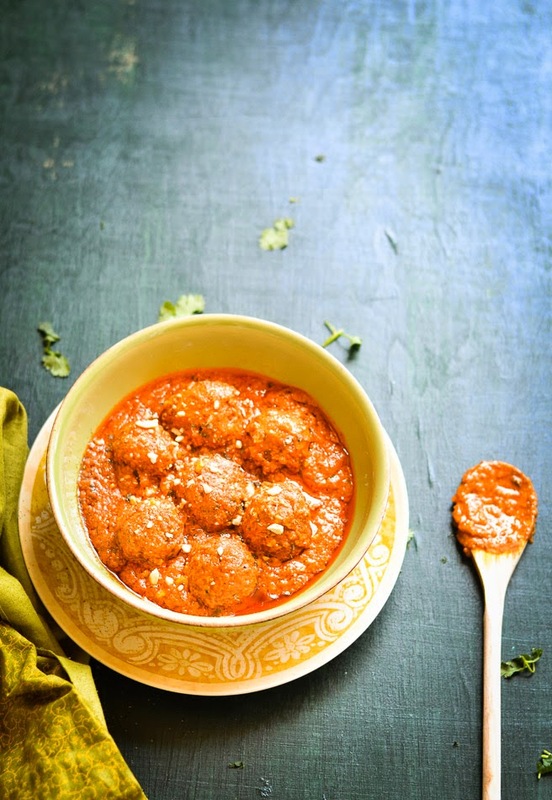 Apart from Malai kofta, Lauki Kofta and Shahi Aloo Kofta are very popular. 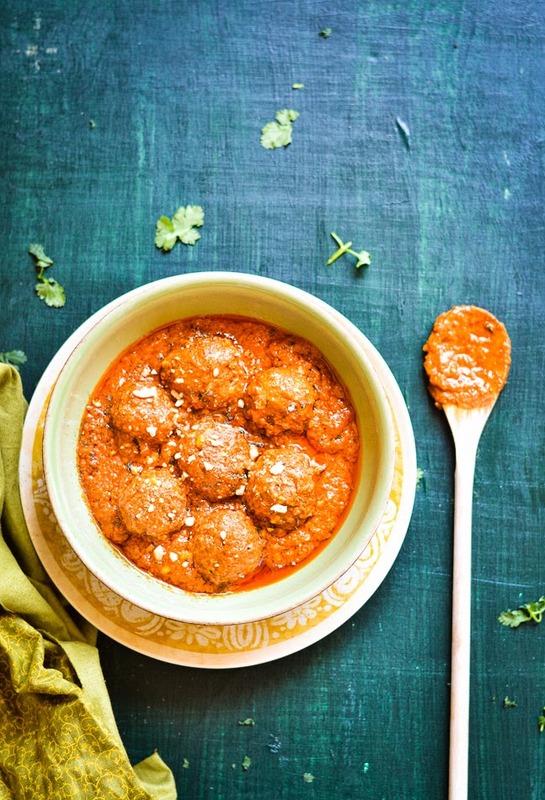 They are shaped like balls and are served with a rich and delicious sauce. The dry versions of koftas are considered to be kebabs. This delicious dish is made of Paneer / Indian cottage cheese, stuffed with nuts and raisins and finally cooked in a buttery, creamy sauce. Malai that is cream in English is the secret of richness for this royal dish. Apart from cream, sauce is made of tomatoes and cashew nuts. There is numerous ways to cook this rich yet elegant dish. 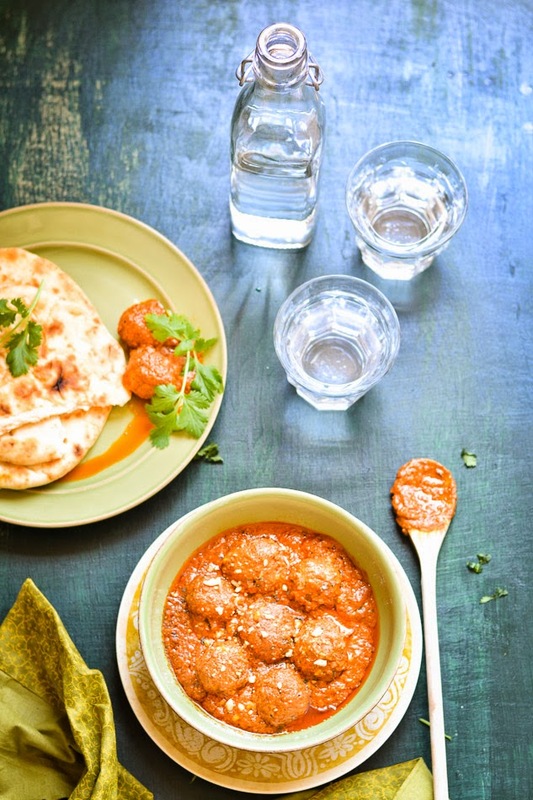 Some sauces use onions while some other recipes use only vegetable dumplings for the kofta, excluding paneer. The sauce can be kept little whitish or spicy red colored. I tried both ways different times and I must say that they both come equally good. 1. Dry roast the red chili and cumin seeds until the aroma comes up. Take it off and let it cool down first, then grind it to a coarse powder. Dry roasted spice powder is ready, set it aside. 2. Take a small bowl, add chopped cashews and raisins. Mix it and keep it aside. 3.Grate or scramble the fresh paneer, and add salt, dry roasted spice powder and the boiled potato. Mash them, till there is no lumps. The mixture should be tight but smooth. 4. Add the flour,( if required ) and again combine well. Divide it into 16 to 18 portions and roll them into balls. 5. Now dig the center of the ball, fill it with little bit of chopped cashew and 1 or 2 raisins. Gently roll it back into a ball and make sure the stuffing is well inside and there is no crack on the surface of the cheese ball. Otherwise, it will be broken or splutter when you deep fry them. 7. For The sauce : Take a big thick bottomed pan, add the oil and heat it up. Add black cardamom, green cardamoms, cloves, cinnamon, and 1/2 tsp of sugar. Saute for a couple of minutes or until they get aromatic and the sugar melts and changes the color. 8. Add the fenugreek seeds, once they sizzle add ginger-garlic paste. Saute until they get browned and fragrant. 9. Add red chili powder and keep stirring till oil starts to separate from the spice. Add the tomato puree and salt. Cook the mixture over medium heat until it becomes thick and oil again starts separating from the all sides of the pan. 10. Now, if you want a smooth and creamy sauce, then switch off the gas. Let the sauce cool down, then blend the cooked sauce in a blender. Otherwise keep this stage. Now in the same pan, add 1 tablespoon oil and add the smooth sauce. 11. Add the cashew paste. Mix it well and add 1 cup of milk. Add the crushed cashew nuts, kasoori methi, and sugar. Add the fresh cream, mix it well. Cover the pan and simmer it over low flame for 10 to 15 minutes. 12. Add the Koftas in the sauce in a single layer. Cook for 3 to 4 minutes more. Malai Kofta is ready to serve. Check seasoning, add salt or sugar if needed. Garnish with grated paneer / fresh cream and serve immediately with Pulav or Indian Flat bread. you know, i started following your blog a while ago..the first day i came here, i must have got 3 recipes printed and took them home. As much as i love reading your recipes and trying them out, the pictures...oh the [pictures are sooo enticing . keep up this beautiful page ! Thanks a lot for such inspiring words!